Though probably insensitive to the fire ants who called this ant hill home, pouring molten aluminum into the ant hill reveals the intricate labyrinth of tunnels and passageways hidden underneath the ground. It's incredible and beautiful and almost looks like a Christmas tree. 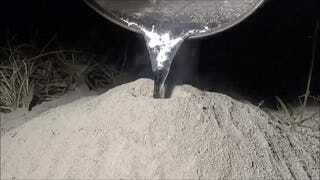 The molten aluminum was poured inside the ant hill's opening until it hardened and then excavated from the ground. Anthill Art then had to blast the sculpture with water to remove the excess dirt surrounding the tunnels to get the beautiful sculpture above. Harsh for the ants, yes, but an endlessly fascinating look at an ant's life for the rest of us.